We offer you private, shared and Luxury transfers from any Dominican Republic airport or private residence to any hotel or attraction. We use exclusively modern and comfortable minivans and buses and we serve the Punta Cana, Santo Domingo, La Romana, Samana, Puerto Plata and Santiago airports. Please just take a look below and in case you have multiple destinations just request a quote. Our fleet is totally equipped for your greatest convenience and they are your best choice for any of our Dominican Republic airport transfers or tours. Every vehicle is equipped with air conditioning and our drivers are very friendly and professional. It will be their pleasure to drive these nice vehicles and take you to your destinations through the highways of our Dominican Republic. We use our Hyundais H1 for our private and shared transfers in the Dominican Republic for up to 6 people plus luggage. They have comfortable seats, front and rear air conditioning and room enough for the group's luggage. This van is available for all our Punta Cana (PUJ) airport transfers, Santo Domingo (SDQ) taxi services, La Romana (LRM) airport transfers, Samana (AZS) airport transfers, Santiago (STI) airport transfers, Puerto Plata (POP) airport transfers or any other destination in the country. 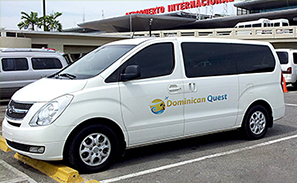 Gorgeous van for your transfers or excursions in the Dominican Republic. 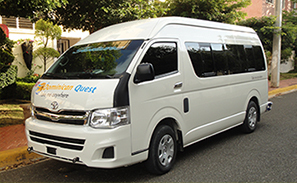 We use this Toyota Hiace Commuter vans for up to 10 people with luggage but with the use of a luggage trailer we guarantee a smooth transfer or tour for up to 14 passengers with enough room for everybody. It has a very convenient high roof which allows for getting on board on a standing position. Enjoy the ride and book one of our transfers or tours in Bavaro, Bahahibe, Juan Dolio, Boca Chica, Santo Domingo, Puerto Plata, Samana or any other destination. 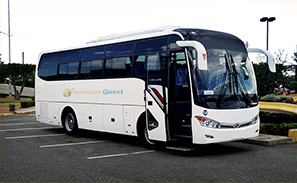 In case you are travelling with a group of up to 22 friends or relatives and need to organize for transfers or excursions in the Dominican Republic we highly recommend the confort the Toyota Coaster bus has to offer. No luggage trailer needed for up to 16 passengers. For groups between 16 and 23 we would use a secure luggage trailer to accommodate all your bags and suitcases. 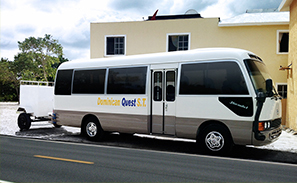 Order this bus for your tours or any shuttle service in Punta Cana, Santo Domingo, Bayahibe, Santiago, Samana or Puerto Plata or any other destination in the Dominican Republic. For big groups wishing for shuttle services in the Dominican Republic or excusions, no problem! We have them covered. This Modern and gorgeous Yotong bus will accommodate a group of up to 45 passengers and will have plenty of space for even your surfboards, huges golf bags, you name it. Order our Yutong bus for transfers between Punta Cana and Santo Domingo or any other tours or any other of our Dominican airport transfers. 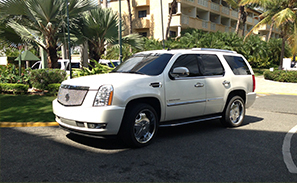 You can experience our FIRST CLASS Punta Cana Airport transfers onboard one of our Cadillac Escalades. This is a perfect option for those wanting to arrive to any Hotel in Punta Cana, Santo Domingo or Bayahibe in comfort and style. Upon your arrival, your chauffeur will be waiting for you to assist you and your party. At the end of your stay in Bavaro, Bayahibe or Santo Domingo weï¿½ll return you to the airport on-time and stress-free in one of our luxury and gorgeous Cadillac Escalades.